Microsoft Azure has long proven it’s a force to consider in the world of cloud computing. 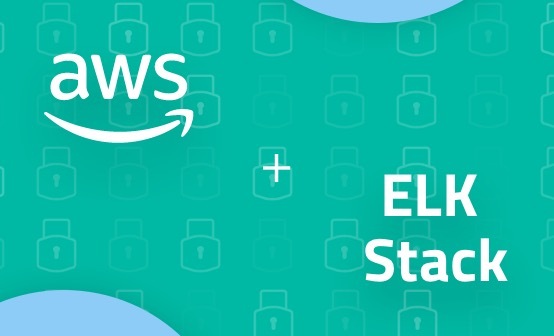 Over the past year, Azure has made some significant steps in bridging the gap with AWS by offering new services and capabilities as well as competitive pricing. 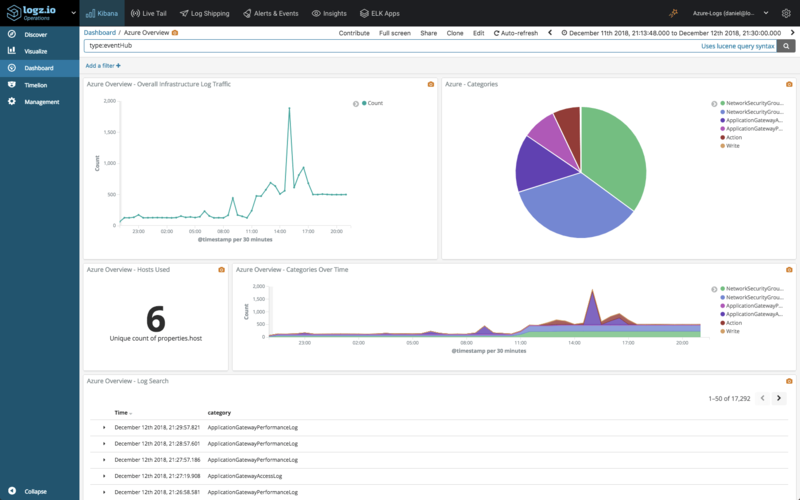 A growing number of our users are Azure fans and so we’re happy to introduce a new Logz.io integration for Azure as well as premade dashboards for monitoring different Azure resources! 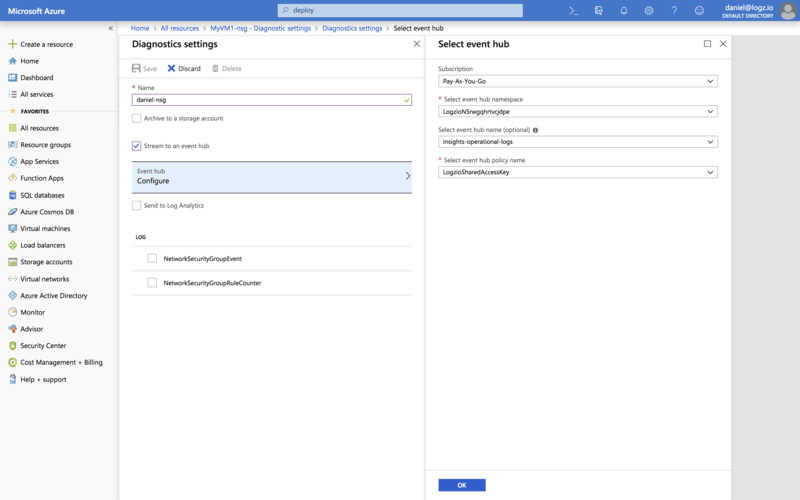 The integration is based on a ready-made Azure deployment template that sets up all the necessary building blocks of the pipeline — an Events Hub namespace, two Events Hubs, an Azure Function app, two Azure Functions, two Azure Storage Blobs, and all the correct permissions and connections required. 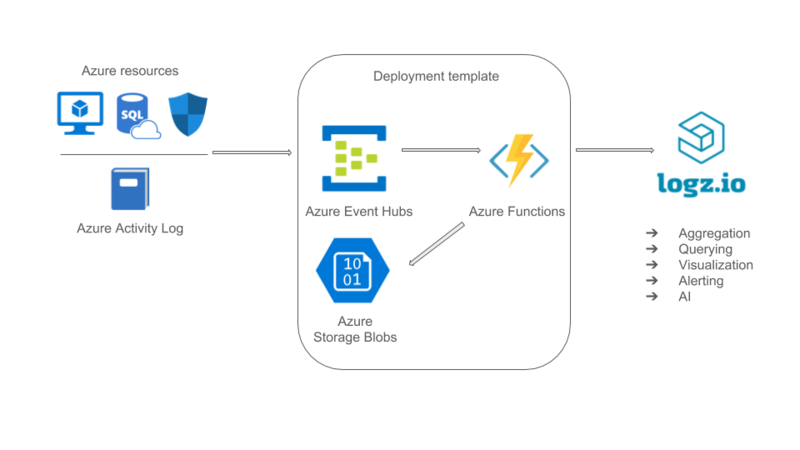 The Azure functions are triggered by data streamed to an Event Hub from your Azure resources. 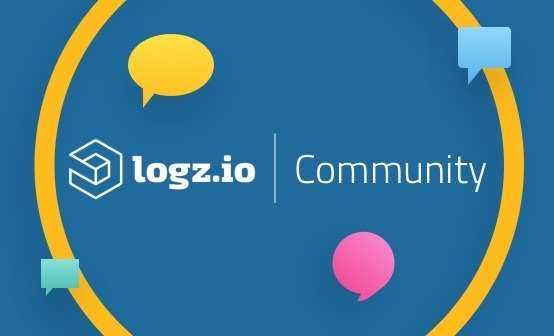 The functions process the data, whether logs or metrics, and forward it to a Logz.io account for aggregation and analysis. 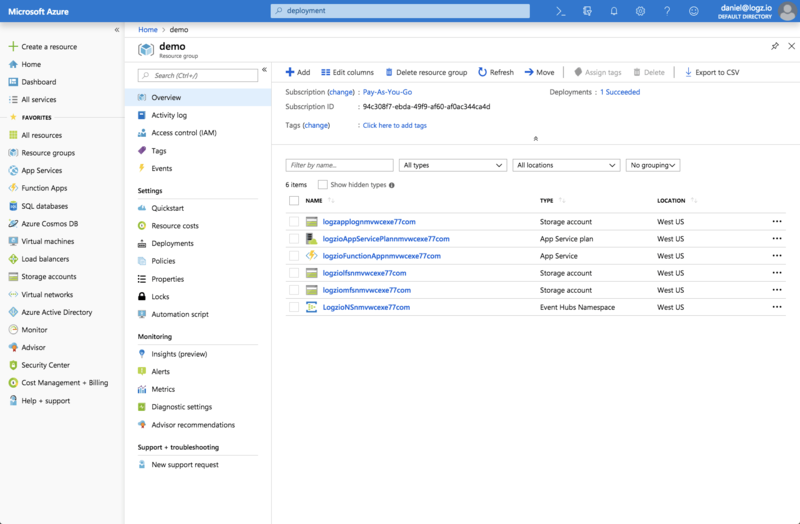 For backups and archiving, you can use the Azure Storage Blob created as part of the deployment. 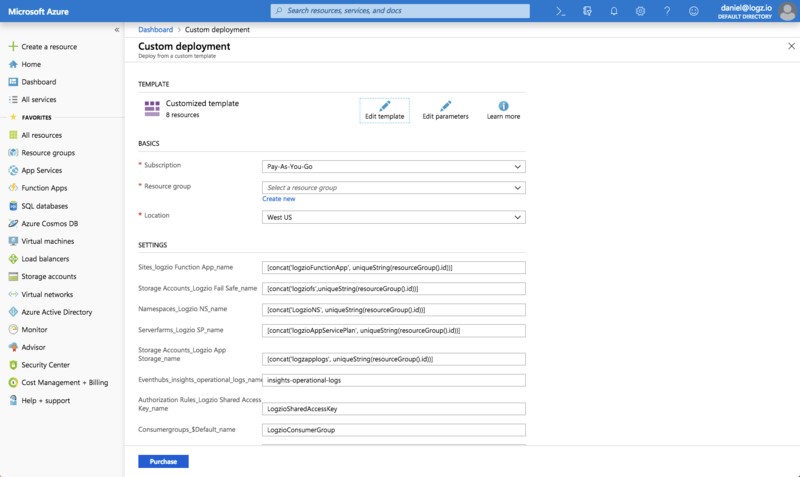 In this article, I’ll take you through the steps for deploying this template and using it to integrate your Azure environment with Logz.io. Our first step is to deploy the Logz.io Azure integration template. Once clicked, the Custom Deployment page in the Azure portal will be displayed with a list of pre-filled fields. Resource group: Either select an existing group or create a new one. Logzio Logs Host: Enter the URL of the Logz.io listener. If you’re not sure what this URL is, check your login URL – if it’s app.logz.io, use listener.logz.io (this is the default setting). If it’s app-eu.logz.io, use listener-eu.logz.io. Logzio Metrics Host: Enter the URL of the Logz.io listener. If you’re not sure what this URL is, check your login URL – if it’s app.logz.io, use listener.logz.io (this is the default setting). If it’s app-eu.logz.io, use listener-eu.logz.io. 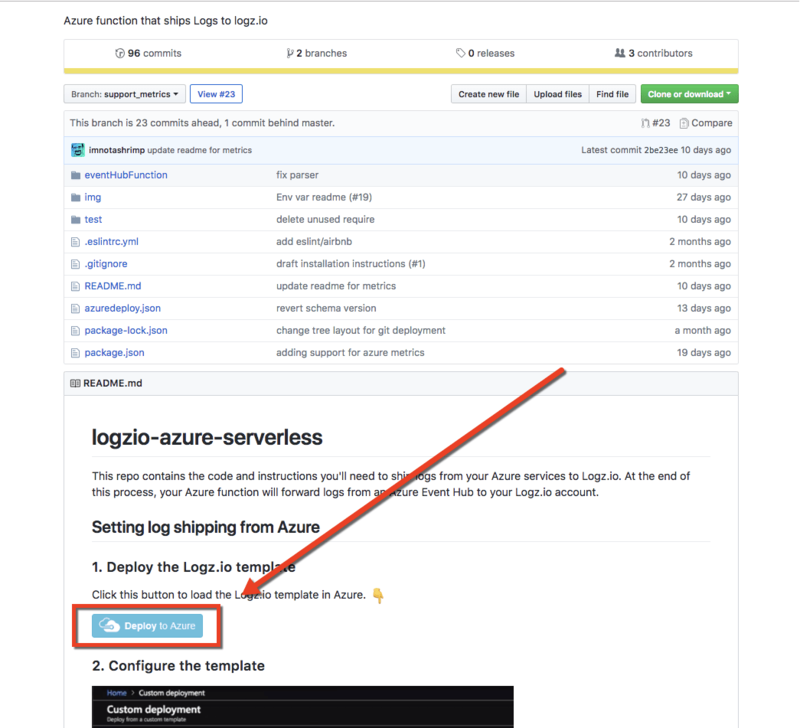 Logzio Logs Token: Enter the token of the Logz.io account you want to ship Azure logs to. You can find this token on the account page in the Logz.io UI. Logzio Metrics Token: Enter a token for the Logz.io account you want to use for shipping Azure metrics to. You can use the same account used for Azure logs. Agree to the terms at the bottom of the page, and click Purchase. Azure will then deploy the template. This may take a while as there is a long list of resources to be deployed, but after a minute or two, you will see the Deployment succeeded message at the top of the portal. Azure Monitor collects a large amount of operational data from various Azure resources to provide users with insight into how these resources are running. 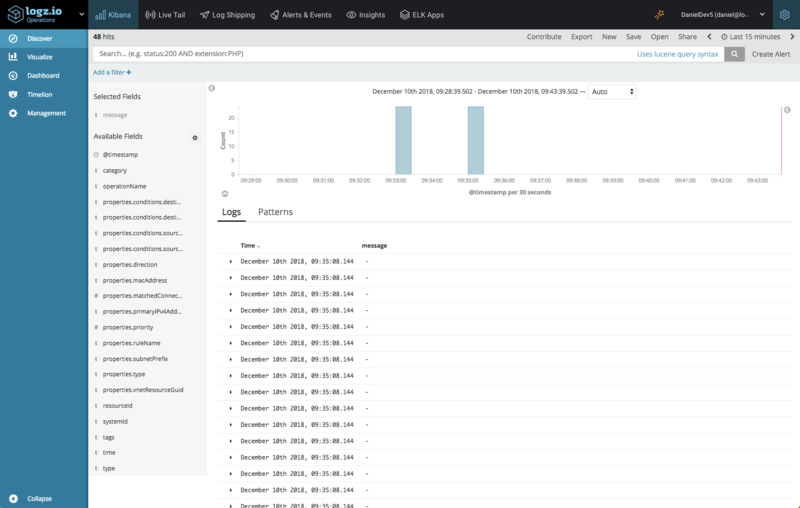 This data can be either metrics or logs, and can be sent to an Azure storage account or Event Hubs for archiving and streaming into 3rd party applications. We will be using the latter option for streaming data into Logz.io. In this case, I’m going to send diagnostic logs from a Network security group. To do this, select the Network security group you wish to ship diagnostic logs from, and click Diagnostic settings. Enter a name for the settings, select Stream to an event hub and then click Configure to configure the event hub settings. 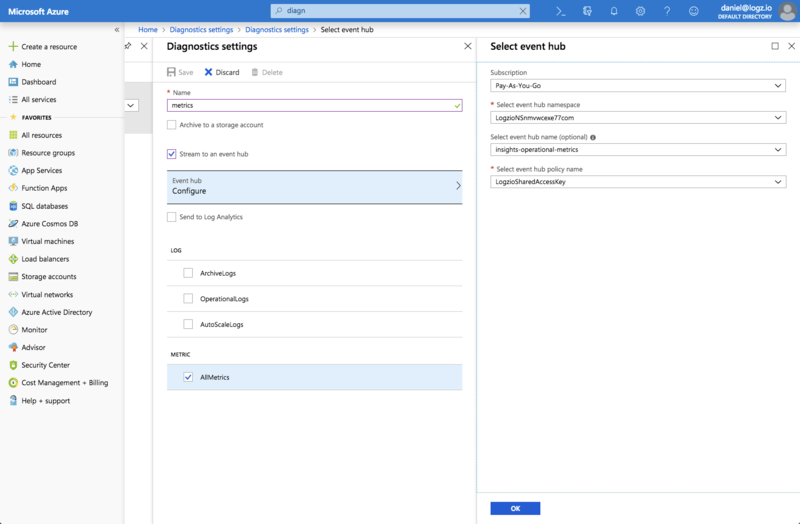 Select the event hub namespace, event hub (insights-operational-logs) and the event hub policy name that the deployment template created. Click OK, and under the log section, select the log data you want to ship. That’s it! 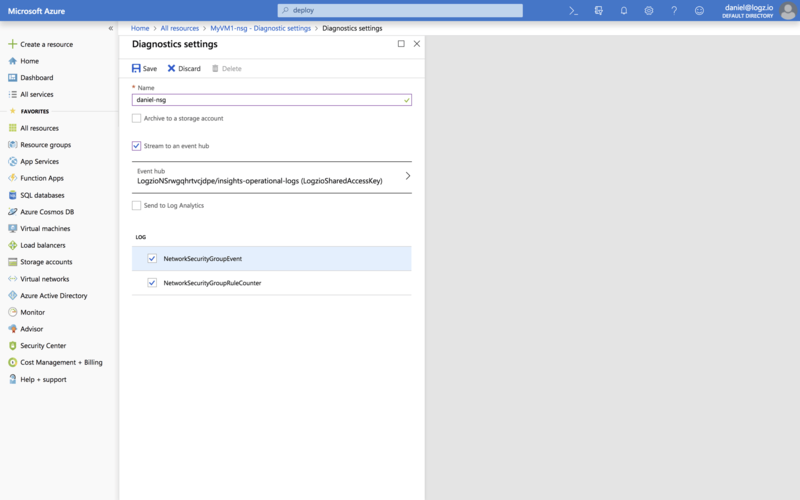 Azure will apply the diagnostics settings and within a minute or two you will be able to see logs from your network security group in Logz.io. To ship Azure metrics to Logz.io, simply repeat the same process. 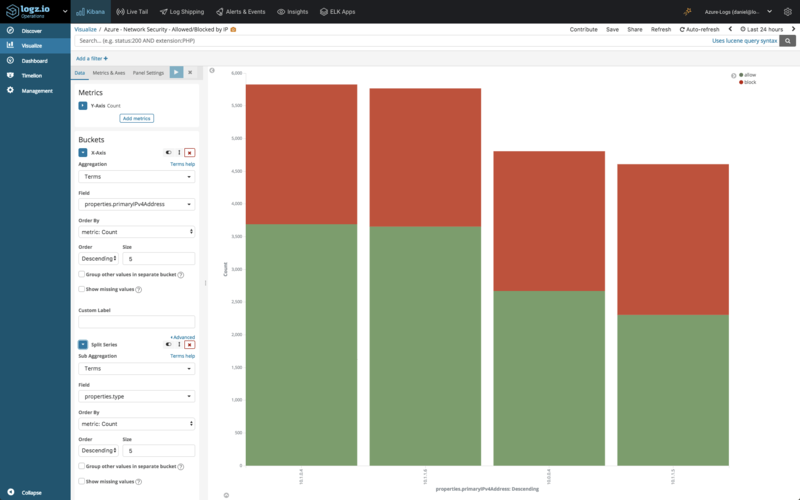 This time, however, be sure to select the metrics Events Hub created as part of the deployment template (insights-operational-metrics). This ensures the metrics are parsed correctly by the correct Azure function and streamed to the Logz.io account you defined for storing metrics when you deployed the template. 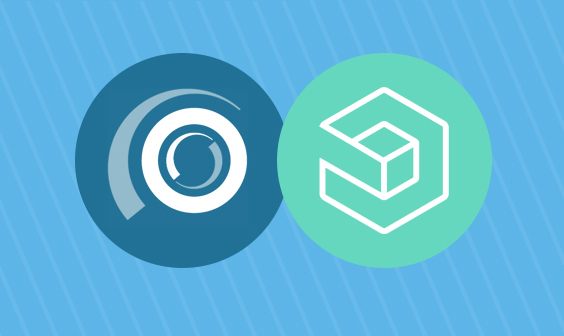 Logz.io provides various tools for using the collected data for monitoring and troubleshooting. To search for specific events, you can use the search box at the top of the Discover page to enter different types of queries. Logz.io provides a powerful alerting mechanism that allows users to be more proactive when monitoring their Azure environment. 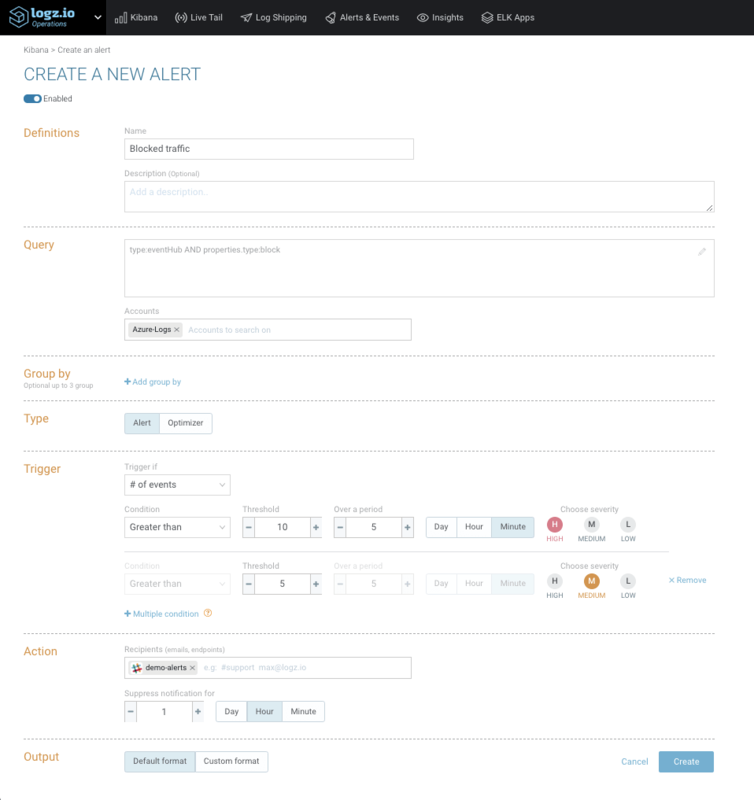 Based on a query, you can define what event to be alerted on and how. Here I can define the alert conditions – the exact threshold for triggering the alert, severity levels, who to notify and in what format. You can notify teammates via email, Slack, PagerDuty, and more. 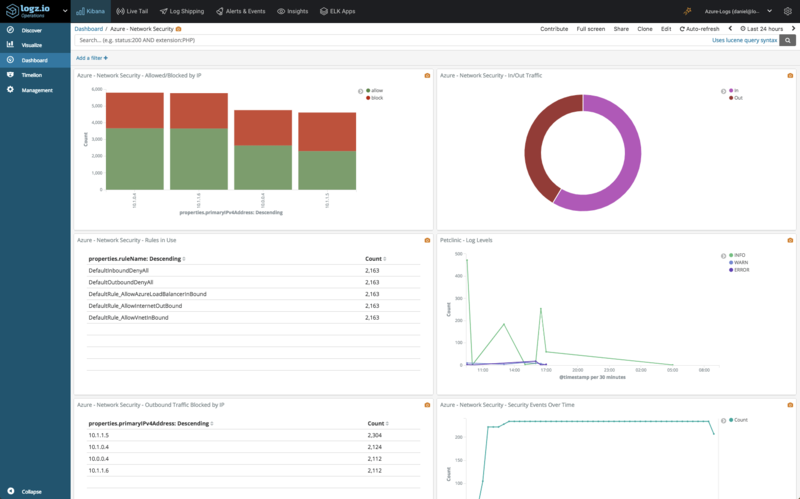 Azure generates diagnostic logs and metrics for a variety of resources, providing users with extremely useful data for monitoring and troubleshooting an Azure environment. We described collecting and analyzing Network Security Group diagnostic logs. For other Azure resources, simply repeat the process above for each resource you have deployed, whether it’s an SQL server, an application gateway, a network security group, and so forth (a list of the resources diagnostics data is available for can be found here). You can use the same Azure function and Event Hub for streaming the data into Logz.io. 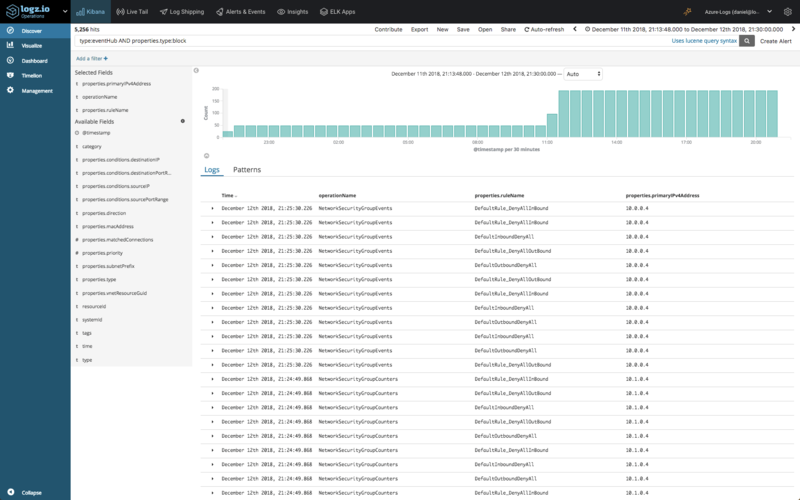 Azure also generates what are called Activity Logs — for monitoring who did what and when for any resources in a specific Azure subscription. Using the integration described here, this data can also be shipped into Logz.io for analysis (we’ll cover this use case in the next article on Azure monitoring). Grabbing both these types of Azure logs, you’ll be able to gain a complete view of your Azure deployment. 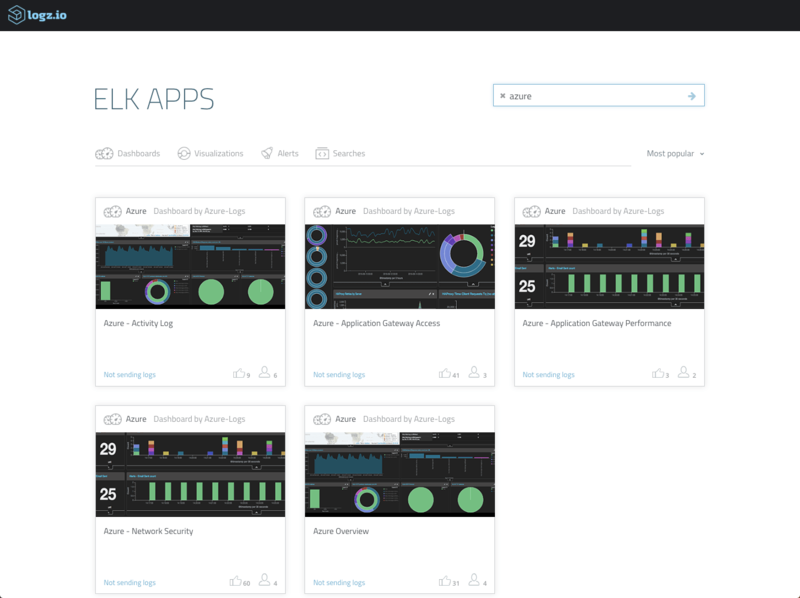 The dashboards shown above are available in ELK Apps — our library of premade dashboards and visualizations for various platforms and environments, including now Azure as well. These dashboards can be easily deployed with one click to save you the bother of starting from scratch. We’re working on some new integrations with Azure that will make it even easier to collect, stream and analyze data in Logz.io, so stay tuned. The combination of Azure and Logz.io gives users the opportunity to enjoy the best of both worlds — scalable and reliable cloud computing resources together with advanced machine data analytics to be able to monitor them.